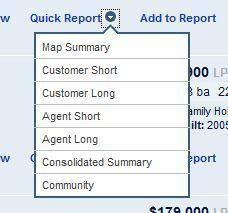 You create a Report by selecting properties to be included. You can add all the property matches at once to a Report, select individual matches on a case-by-case basis or run a report on a single property with a Quick Report. The number of properties you select for the Report displays in the Report Bin. The Report Bin is visible on all three pages (Property Search, Settings and Tagging). Tip: Before creating Reports, it is good practice to narrow your search results to a manageable number of properties to report. An option for creating a Report for just one property at a time is to use the Quick Report link in each property detail section. Click the link on the desired property and select the desired report type. The Report module will open containing the details for that property. Proceed from this point as you would for any Property Report. From the Matching Property list, select the properties to include. 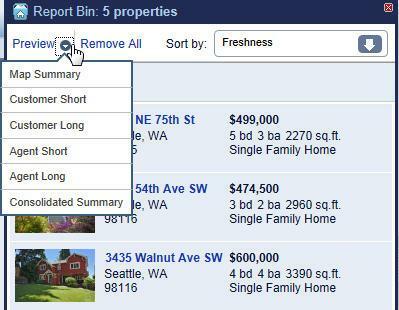 You can include all properties displaying on the page by clicking Add to Report at the top of the Search Results list. Note: If you have more than one page of results, you will need to add the contents of each page independently using this command. Add one property at time by clicking Add to Report below the property information. Note: Each property displays only once; any duplicates are ignored. When you are ready to create the Report, click on the Report Bin. The Collection Display page opens. From here, you can Remove or change the order of collected properties or access Driving Directions. Click the Report Bin. A preview of the properties you have collected displays. Properties will appear in reports in the same order as they do here. (Optional) Click the ―X” next to a property to remove it from the collection. (Optional) Click Remove All at the top of the preview to clear the entire report. Note: The “X” appears in the upper-right corner for each property only when the mouse pointer is over the property. Once you have collected properties and removed or sorted the order of those properties in the Report Bin, you can Preview your report. 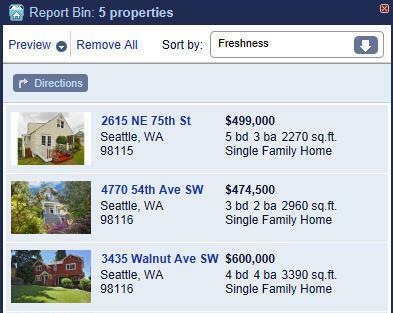 At the top-left of the Collected Properties display, click Preview and select the report type from the drop-down menu. You can choose additional report types from the Report Type drop-down list in the Report module. Select additional choices from drop-down menu and the preview will update automatically. When you have finished, you are ready to save the report, create a link to email the report or create a PDF version of the report. Next Lesson: Finalizing Reports on Find.